There is another side of Las Vegas that many people often overlook. Blame it on the allure of the flashing neon lights or the anticipation of visiting the casinos for the first time, but many tourists remain on the infamous Vegas Strip for most of their trip. Unfortunately, by doing so, they neglect the other areas that have so much more to offer like Downtown Summerlin Las Vegas. If you only visit Vegas for the bright lights and visiting the casinos, you are missing a broad range of activities that can help make your trip a memorable experience. 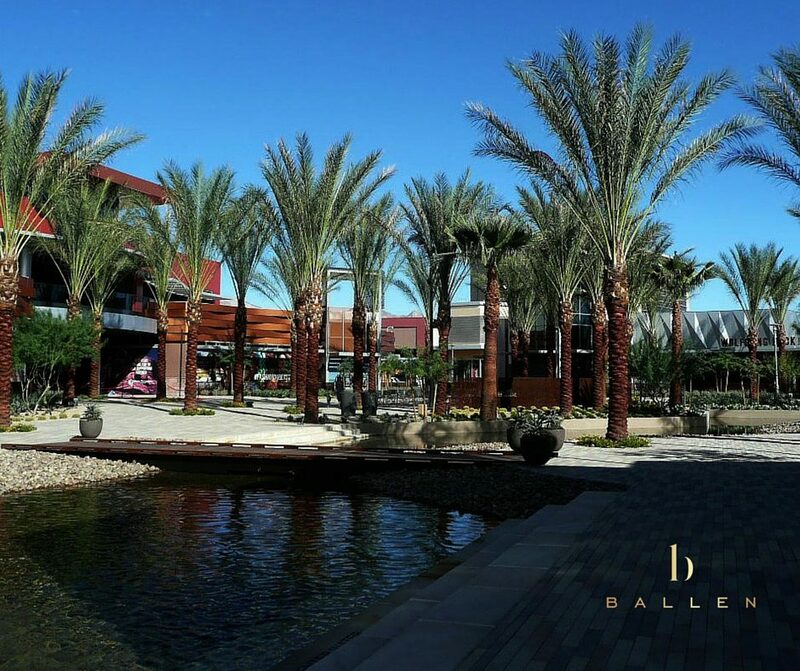 These fun and exciting opportunities for shopping, fine dining, and entertainment, can be found in the nearby community known as Downtown Summerlin, the mall in Summerlin. This shopping center was formally considered “The Shops at Summerlin”. If fine dining is in your repertoire, there is an endless selection of local favorites and popular chain restaurants that will satisfy anyone in your group. This Summerlin shopping center offers exciting events for locals and tourists all throughout the year. So, no matter when you choose to visit the Silver State, you will have something unique and exciting to do, such as visiting the Farmer’s Market or taking part in Yoga on the Lawn. It doesn’t matter what you’re into; you can find something to keep you entertained while visiting the Summerlin Shopping Center. There are opportunities to shop, dine and take part in various activities that take place year-round. For the locals who have access to the area all year round, they may visit the fine retail stores and restaurants quite often. To ensure that the location is new and exciting for both Las Vegas residents, and tourists alike, the area hosts a wide assortment of exciting activities that keep patrons coming back to discover what’s new. For tourists, the Summerlin Mall gives the stressed-out traveler a place to relax and unwind. While Las Vegas is a fantastic place to visit, the lights, crowds, and excitement can be overwhelming for some people. A visit here can help bring you back to reality as you enjoy a refreshing meal at a local restaurant, taste some of the best wine the country has to offer, or take in some retail therapy while browsing through some of the most popular stores in the area. 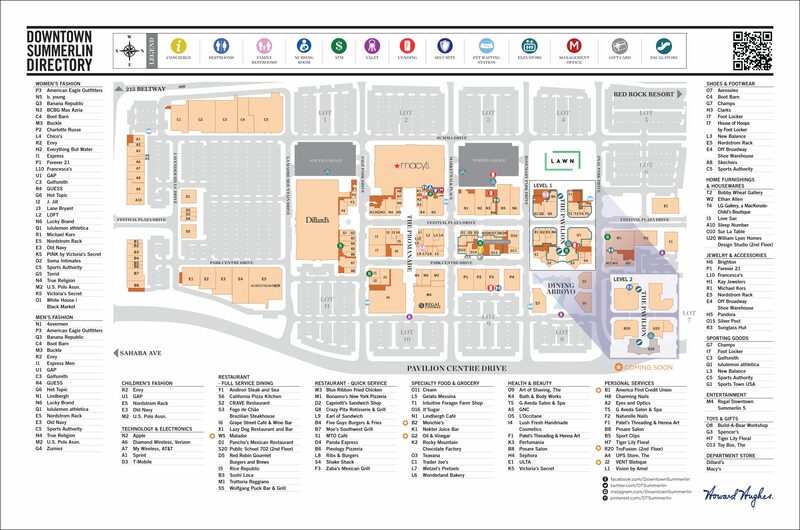 The center is located at 1980 Festival Plaza Drive in Las Vegas, and it is very easy to find. Prepare for spring as you shop the stores located at the Mall for all the latest in Spring fashion. Locals and visitors alike enjoy shopping at familiar stores such as Macy’s, H&M, and Dillard’s for all their fashionable wardrobe necessities. 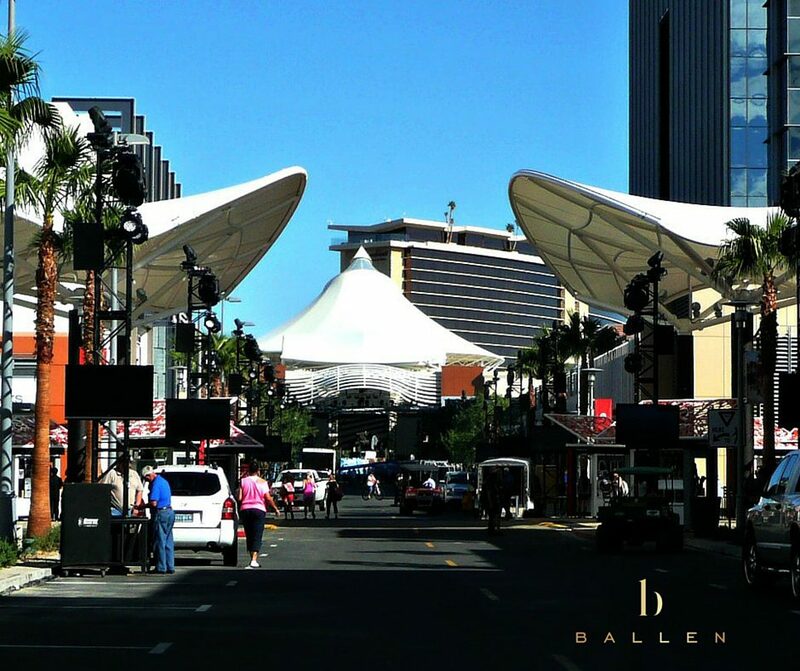 Downtown Summerlin is a special part of town because it allows you to escape from the busy atmosphere of nearby Las Vegas, all without taking you too far away from the action and excitement. Summerlin offers you amazing views of Red Rock and the Strip. The area is also growing with modernized commercial properties showing up all throughout the downtown area. There are also plans for a residential community that will contain more than 4,000 multi-family units, as well as commercial buildings for office space, retail stores, service centers and entertainment space. This 400-acre area located between Charleston and Sahara near the Red Rock Casino hopes to be the new urban core of the community soon. The vision for the new Summerlin Shopping Center in the future is filled with luxury, modern architecture, and plenty of convenience for those who will call the area home. The five theaters are small and very comfortable, making the experience more like watching a movie in your own home. The Regal Downtown Summerlin 5 is a great addition to the area and is sure to bring even more people to this special location. Looking for a theater that not only shows the latest movies but also lets you do so in luxury? Look no further. Unlike other movie theaters, this theater features reservable seating during most of their screenings. This means that you will never have to worry about someone stealing your seats ever again. Unlike many other movie theaters in the Las Vegas Valley, with uncomfortably stiff seating, most of the Summerlin 5’s seats are also king size luxury recliners that allow you to be as comfortable as can be while watching the latest movies. In addition, the concessions at the Summerlin shopping center theater blow every other theater out of the water. Their kitchen serves a variety of foods such as mac & cheese bites, pizza, bacon cheeseburgers and marble chocolate chip cheesecake. If you are in the mood for an adult beverage, the theater’s bar also features mixed drinks, wine, and beer. 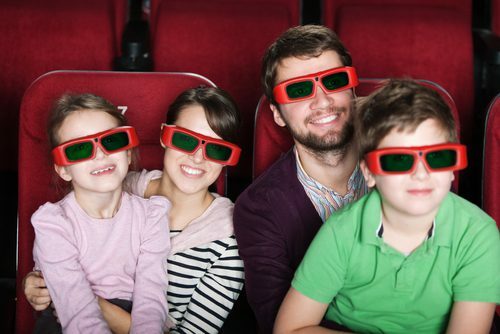 Not only can you bring your food and beverages with you to the showing itself, employees (after the film’s pre-show previews begin) will actually take your order and bring it to your seat. Essentially, there is no need for you to leave your seat to get food or drinks! If you would like to visit, it is located in Downtown Summerlin across the street from Forever 21 and down the street from Buckle. In order to see what films are currently showing or to reserve tickets/seats at the Summerlin 5, you can visit their website. All you have to do is click on whatever show time is most convenient for you, choose your type and number of tickets, pick your preferred seats and pay online. Once you see a movie here, you will never go back to an ordinary movie theater. What should you do while spending the day in Downtown Summerlin? First, you should check to see what special events are taking place in town. You may have the opportunity to catch a live music show or take part in a charity walk-a-thon. If you are in town to shop, there are all types of retail stores that offer everything from clothing to shoes to home furnishings. You can spend the entire day browsing the specialty shops or adding to your spring and summer wardrobe. For lunch, there are many options to accommodate all tastes. You can hang out at Dave & Buster’s with your friends, or enjoy a dinner date with someone special at Casa Deli Matador. Keep in mind while visiting the area, the public hours are from 10:00 a.m. to 9:00 p.m. Monday through Saturday, and from 11:00 a.m. to 7:00 p.m. on Sundays. Other people have asked: Where is the Best Pool in Las Vegas? So more than only the Summerlin Mall, Downtown Summerlin offers parades, themed events, holiday parties, dining, entertainment, shops, treats and more.